The best way to get more customers (based off of closing rate) is when someone first comes through your website. Yet, many shops are still having trouble converting website visitors into actual paying customers. Join us for a free webinar where we will discuss how correctly messaging customers on the right channels can bridge the information gap and help your shop convert website visitors into paying customers. Up until now, it's been cost prohibitive for tire shops to enter the replacement key business. Now that is changing, creating one of the largest new opportunities for shops in decades. During this free webinar you'll learn tips and tricks to maximize this opportunity. How to End Price Wars – the "Race to Zero"
Tired of selling on price? There is a proven way to end your dependency on price and stop killing your profit margins. During our dealer panel webinar, you will learn what motivated them to end their war on price, how they changed their conversation to remove price wars from their shop, and see measurable results from making the commitment to change. Online shopping has changed the way that consumers behave. Convenience now tops the list of consumer expectations and businesses that aren’t catering to these expectations will be passed over for those that do. In this webinar, we will discuss how your business can compete in today’s convenience economy and meet the expectations that consumers now have. Are you Taking Advantage of this TPMS Opportunity? Replacing TPMS service kits every time a tire is removed from the rim is a recommended best practice. During this 30-minute educational webinar, we will explain how valve stems have evolved over the years with the addition of TPMS. In the second half of this webinar, we will explain how to significantly increase sales with consistent service kit replacement. During this panel discussion, you’ll hear from four successful dealers across the United States. They’ll talk about what it means to truly focus on the customer, the steps their shops took to make the transformation, and the results they received. Online reviews are the new word of mouth. They play a significant role in how consumers ultimately find and choose your shop. In this webinar, we will cover how online reviews improve discovery by boosting your local SEO ranking, driving traffic to your storefront, and influencing purchase decisions. During this 30-minute educational webinar, Schrader’s Senior Technical Trainer and Certified TIA Advanced Instructor, W Rippetoe, will help you tackle difficult TPMS relearns for specific vehicles. W will briefly cover the basics of a TPMS relearn, then dive into five specific vehicle relearns that have unique processes. During registration, you will have the opportunity to provide any specific vehicle relearn procedures that you would like to learn about during this webinar. Learn a new and simple approach to more tire sales. 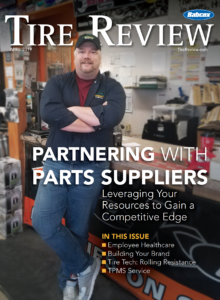 Find out how to close more tire and service appointments (and more sales) from day one; how to practice effective communication every day; and how to improve the communication skills of your employees, on the phone and in the shop. Learn how specific messaging tactics will significantly boost your levels of customer service while increasing revenue. The presenters will also give you tips and tricks for implementing a messaging strategy that works best for your tire business. eCommerce sales this holiday season are expected to increase 15.8% from last year. Tire retailers are gearing up for the holidays and detecting good orders from bad. Now is the time to dial-in your fraud management strategy and prepare to sell more than you have the entire first part of the year. Attend this webinar to hear from fraud experts how to properly identify naughty and nice customers with ease. TPMS has already proven to be a huge profit builder for many shops in North America and now around the world. However, TPMS can also be confusing if proper training and standard operating procedures are not in place. During this 30-minute educational webinar, you'll receive recommendations for TPMS shop management. There are many unrealized sales opportunities in just about every auto repair and tire dealership. During this free Tire Review webinar on Tuesday, September 26, pick up one amazing sales training tip that will change the focus of your company. Identify key points in the tire buying experience when your customers are most open to influence, so you can better engage with them. Attend this webinar to learn how to create a customer interaction strategy, and get best practices for communicating with your customers. Rotors are highly-engineered components on both a mechanical and molecular level. Find out how metallurgy influences the performance of a rotor, how carbon content can improve a rotor’s strength, proper installation methods, and how you can give your customers different rotor options. During this 30-minute educational webinar, Schrader's Senior Technical Trainer and TIA-Certified Instructor, W Rippetoe, will discuss the basic concepts around TPMS. He will review the fundamentals of Test Before Touch, service kits, types of sensors and best practices. You will also have the chance to tap into his general TPMS knowledge during the FAQ session. Word of mouth is your best form of marketing, and it’s especially important in today’s digital world. Learn how positive online reviews can help you increase word of mouth for your tire dealership -- and ultimately drive more revenue. Find out how reviews impact your local search ranking, and pick up tips for collecting hundreds of reviews. Hear about the most important practices around TPMS relearn procedures. During this free webinar you’ll hear about the difference between programming and relearning, the three types of relearn procedures and when to use each, and several tricks for performing relearns quicker. Your shop can service more tire pressure monitoring systems and increase profits simply by talking to the customer and covering several important points. During this free webinar, certified instructor W Rippetoe will discuss how having a Standard Operating Procedure around TPMS can help your shop generate more sales, as well as improve safety and address liability issues. Are You Ready for the TPMS Sensor Bubble? There is a large population of vehicles entering the sweet spot for TPMS sensor replacement. This free 30-minute webinar will look at how to diagnose dying sensors, answer the questions about when to replace sensors, and show you how to package multiple sensors. Brake & Front End editor Andrew Markel, an ASE-certified technician, will show you how to perform advanced TPMS diagnostics.